The #WalkForFreedom is a global event to raise awareness for the fight against human trafficking. Please help me to reach my fundraising goal by donating online. Thank you! account_circle The #WalkForFreedom is a global event to raise awareness for the fight against human trafficking. Please help me to reach my fundraising goal by donating online. Thank you! Right now, as I write to you, there are more slaves in the world than at any other point in history. The exact number is 27 million and the phrase used is human trafficking. After I heard these statistics I decided I wanted to be a part of the solution. 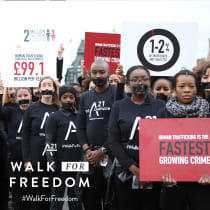 On October 15th, I am joining A21 for the 3rd annual #WalkForFreedom.Around the world individuals like myself will join A21 in a silent walk to stand up for the voiceless who are trapped in slavery. In addition to walking, I am raising funds to further the fight for freedom.I have a goal of €100,- and I would love your support as I work to reach my goal and impact the world. From medical assistance to education and clothing, every survivor has extensive needs and I am excited to play my part in the restoration process. I ask for you to come alongside me and support the fight to end human trafficking. If you are able to give, please visit my fundraising page to support me and the fight for freedom. P.S.- If you would like to know more about human trafficking and A21’s response, please watch Anna’s Story.